Galaxy Alpha: What is the Smart Scroll™ feature on my Samsung Galaxy Alpha? CLICK THE IMAGE BELOW TO VIEW THIS TOPIC IN THE SIMULATOR. 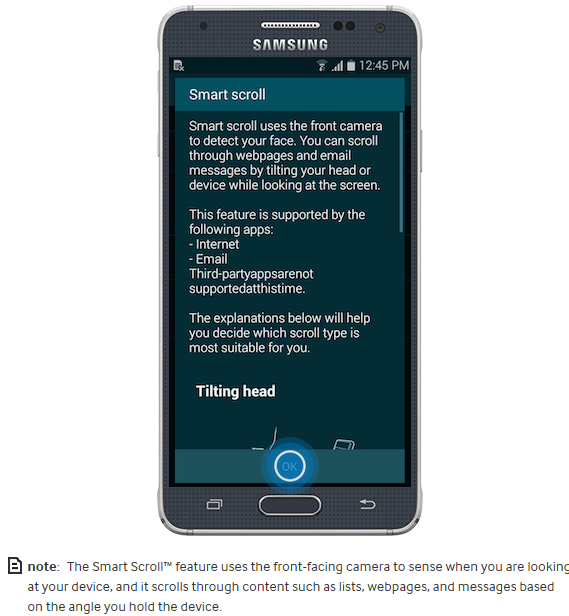 The Smart Scroll feature uses the front-facing camera to detect when you are looking at your device, and it scrolls through content such as lists, webpages, or messages based on the angle of the device. 3. Scroll to and touch Accessibility . 4. Touch Dexterity and interaction. 6. Touch the slider to turn Smart Scroll on . 7. Review the information about optimal conditions for Smart Scroll use. Then touch OK.
• Tilting head (default): Use Smart Scroll by tilting your head forward or backward. 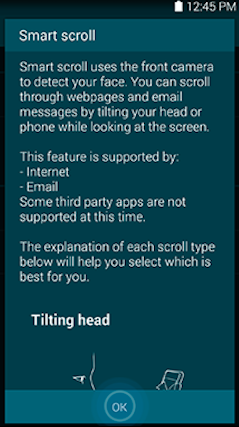 • Tilting device: Use Smart Scroll by tilting the device forward or backward. • Speed: Adjust the scrolling speed that Smart Scroll will use. Drag the slider to the left or right to decrease or increase the scrolling speed. • Visual Feedback display: Display a visual feedback icon during Smart Scroll use. • When the front-facing camera fails to detect face and eyes. • When the source of the light is behind you or you are using the device in the dark. • When the front-facing camera is being used in an application. • When you are using other gestures, such as Air View™. • When there are pop-up messages or screens being displayed, or you have multiple windows open. Galaxy Alpha: How do I insert the SIM card into my Samsung Galaxy Alpha? Galaxy Core: How do I use the touchscreen gestures? What are the different buttons and other physical features of my Samsung Galaxy Alpha?